Within the Maximized Living eating style, we strive to eat as cleanly as possible. We make substitutions where needed, by cutting out food ingredients that will make us sick or make us fat, and replace with the most whole food alternative that will allow our bodies to thrive (e.g. stevia for sugar, coconut/almond flour for all purpose flour, fruits/veggies for food dyes, spiralized zucchini for pasta…). Another area of substitution is soy. The problem with soy-anything really is that most all of it throughout the world has been so tampered with by Man that it is very hard to find non-GMO soy and soy products. On top of that, too much soy in our diet (and where isn’t it in packaged foods these days?) can cause an overload of estrogen in the body for both men and women. The body reads soy as a form of estrogen, and too much can throw your endocrine system into a downward spiral. Whether you are part of Healing Cuisine because you are in the Maximized Living family, a raw foodie, gluten free eater, or simply interested in eating healthier, you should set a goal to limit, and optimally eliminate, soy consumption. I have found a product from the company Coconut Secret to help us with the burden of soy. Their product Raw Coconut Aminos is my new favorite and most trusted alternative to soy sauce! 1.) Bragg’s Liquid Aminos still come from soy. Personally, I battled endocrine disruption in my body (what I think was PCOS but never had it “diagnosed” in a hospital, and infertility), so I avoid soy at all costs to not undo the hard work my body went through to get healthy again. Bragg’s Aminos was the only soy product left in our house, and while it is certified non-GMO and fermented, it still comes from soy. I feel safer, personally, using the Coconut Aminos because the amino acids are fermented from organic coconut instead of soybeans. 2.) Coconut Aminos taste 10x better than Bragg’s. This is my personal opinion, so definitely come back and comment below letting me know what you all think after trying Coconut Aminos! I didn’t mind the taste of Bragg’s too much, but did notice it had a super salty taste compared to traditional soy sauce. I often had to water it down or use much less, which made it harder for me to perfect recipes to share with you! I like the rich taste of the Coconut Aminos soooo much more! It’s not as salty and tastes very close to what I remember soy sauce tasting like. And the proof is in the bottle! Coconut Aminos has about 30% less sodium content than Braggs Aminos (113mg per teaspoon Coconut Secret to 160 mg per teaspoon Braggs). In Bragg’s brand, the sodium forms naturally through the fermentation process of the soy, and Coconut Secret adds sea salt, but either way it’s a lot of sodium to be adding to one meal. The less the better! Also, Coconut Aminos are certified organic, raw, gluten-free, contain 17 of the essential amino acids, mineral rich, dairy-free, sugar-free, vegan, Advanced Plan friendly, and as I just said, soy-free. I use these Coconut Aminos on everything — stir fry, kale chips, zucchini noodles, meat marinade, soups and stews, salads, and anything savory that needs a little notch up in flavor. Give it a try in your next recipe. I think you’ll be pleasantly surprised! You can find Coconut Secret’s Coconut Aminos at your local health food store, co-op, Whole Foods, by searching their database for a store near you, or on Amazon.com. Here is a recipe from my friend Kim T. that I love to use the Coconut Aminos in. She shared this frugal and nutritious side dish with me many months ago, and I have been saving it to share with my review of this product. 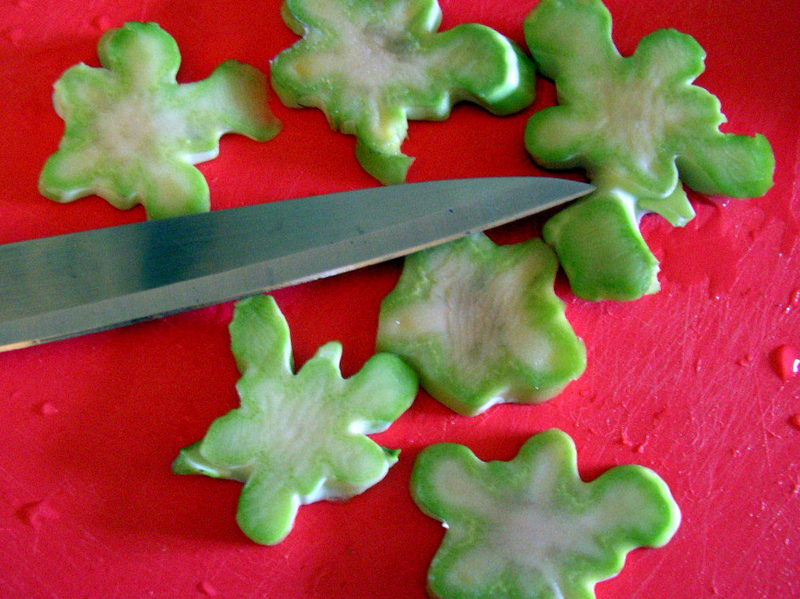 The recipe is called Broccoli Coins, and it is made from slicing the stalks of fresh broccoli into coin shapes. Never waste the most nutritious part of the broccoli again! 1.) Fill a large pot with filtered water and bring to a boil. With a vegetable peeler, peel the tough outer edge of the broccoli stems away. Slice the broccoli stems into coins, about 1/4 to 1/2 inch thick. 2.) Add the broccoli coins into the boiling water. Boil for 3-5 minutes, just blanching to take away the raw taste. Dump into strainer, draining the boiling water. Then immediately submerge the strainer of broccoli coins into a bowl of ice water (to stop the cooking and leave nutrients intact). 3.) Once cool, transfer to serving bowl and toss with Coconut Aminos, hemp seeds, and sesame seeds. If you think it is too bitter, you can add 1/4 tsp stevia. Serve cold or room temp. You can find all products offered by Coconut Secret here at their website. I hope you enjoy this new healthy find! Thank you for your review and dedication to always sharing better ingredient options! As for the recipe…I’ve been looking for ways to use the broccoli stems. Looking forward to giving a try! I hope you like the recipe, Melissa!